Capri by Fraser in Brisbane's CBD is conveniently located on Albert Street so you can hit the shops, dine riverside or make it to your meeting on time within a few blocks. Bedding down in luxury or staying in Brisbane’s hippest haunts needn’t break the budget; book into one of these hotels that punch well above their weight (and price tag). 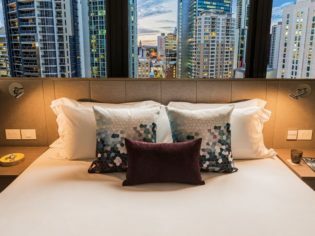 With street art running the height of the glassed elevator shaft juxtaposed against the 150-year-old, recycled timber flooring, and splashes of riotous graffiti-inspired tiling in the black-on-white bathrooms, for the experience you get at TRYP Fortitude Valley Hotel, you’d expect to pay a lot more. With street art running the height of the glassed elevator shaft juxtaposed against the 150-year-old, recycled timber flooring, and splashes of riotous graffiti-inspired tiling in the black-on-white bathrooms, for the experience you get at TRYP, you’d expect to pay a lot more. Throw in the central Valley location, staff dressed in Black Milk threads, Warren Turnbull’s CHUR burgers downstairs, and hip rooftop bar Up on Constance just a short elevator ride away, and you’ve got yourself more hip than you can handle from $129 per night. It’s the seemingly ‘optional extras’ that are usually missing from budget stays, but at the new ibis Styles Brisbane, continental breakfast and wi-fi are thankfully not seen as nice-to-haves, but essential. It’s the seemingly ‘optional extras’ that are usually missing from budget stays, but at the new ibis Styles, continental breakfast and wi-fi are thankfully not seen as nice-to-haves, but essential. The first new-build ibis Styles in Australia, this vibrant and fun hotel is smack bang in the CBD shopping district on Elizabeth Street, so you can take those savings and use them wisely. Another first for Brisbane, Capri by Fraser is light, bright and doesn’t take itself too seriously. From its CBD location on Albert Street, you can hit the shops, dine riverside or make it to your meeting on time within a few blocks. We love the dual-purpose workstation with pop-up vanity mirror, the indoor pool, and a 24/7 Spin and Play launderette where you can play the Xbox Kinect between spin cycles. Book a Club Room for complimentary breakfast and evening drinks and canapes, or nip downstairs for breakfast, lunch or paleo high tea at Pete Evans’ restaurant, Asana. It’s a bit of a misnomer staying in a city hotel that boasts views – from which room exactly do you get to appreciate the city skyline? Just across the Story Bridge in Kangaroo Point, The Point hotel has fresh, clean rooms and a fabulous rooftop bar – the Eagle’s Nest – all accessed by a short ferry ride from the CBD. Extras like 24/7 room service, wi-fi, courtesy CBD shuttle service and free parking prove you get more bang for your buck here, too. Rydges Fortitude Valley promises complimentary wi-fi, round-the-clock room service and gym access, plus a heated outdoor pool, which combine to give you that resort feeling in the middle of a very urban landscape (photo: Richard Lyons). As the Valley sprawl inches its way ever outwards, the newly opened Rydges – across the road from the RNA Showground – is in prime position to hit up the latest restaurants and bars. You’ll even have one-up on the locals when you stay here, with newly minted King Street set to become one of the Valley’s hottest new foodie addresses. Complimentary wi-fi, round-the-clock room service and gym access, and a heated outdoor pool combine to give you that resort feeling in the middle of a very urban landscape.